Tablets can be great educational tools as they are specifically designed for children, meaning they are easy to use and they are packed with fun and educational applications that children can use. Kids tablets have evolved and the technology has become really impressive. They have high resolution screens and contain very engaging educational games and applications with amazing graphics and sounds. The educational applications cover school subjects as varied as math, science, geography, the alphabet, english, art, etc. Most modern tablets for kids also work like tablets for adults. For example, they have cameras that kids can use to take pictures or even film, music players, calendars and other application that tablets for adults have. But unlike tablets for adults they are build to resist the rough treatment that they will get in the hands of children. You don't have to worry about the screen breaking or that the tablet will stop functioning after being thrown on the floor or having water poured on it. Tablets are also great if you go on holidays, they can be easily carried around and they can entertain kids for hours in a car or on a plane. 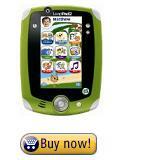 The first tablet that we recommend is the LeapPad 2 by Leapfrog (for ages 3-9). It is one of the most well-known and popular tablets for children in the market. Just like tablets for adults, this tablet has a camera (front and rear), high resolution screen (5 inches) and tons of applications including hundreds of educational games and ebooks (meaning you don't have to buy an ebook reader) that promote learning through play. You can download hundreds of educational applications, leap frog apps and you can also buy LeapFrog cartridges. 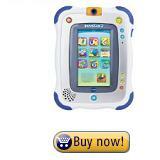 Another tablet that we highly recommend is the Vtech Innotab 2 (for ages 3-9). This tablet also has a camera but more memory that the Leapfrog tablet (it is expandable to a whopping 32 GB). The rubber protecting the tablet is also thicker than the Leappad's. Another thing that we like is that it has a rotating camera, that it comes with preloaded applications and three educational ebooks and that you can download educational applications directly on Vtech's website. It also features a calculator, a clock and a calendar just like tablets for adults. 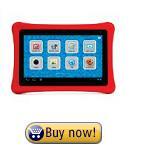 We also recommend the Nabi 2 tablets by Fuhu (for ages 5-9). It is a more high-end tablet (hence the higher price). It runs on a Quad Core CPU (translation: a super powerful computer chip) which means that it runs very fast. It has a very high screen resolution (and a larger screen than Leappad or the Vtech Innotab 2) and we believe is the best 7 inch tablet. Furthermore, the tablet features an incredible number of educational applications, a chore list similar to chore charts for kids and child friendly music and streaming TV programs. It also has parental controls and filters that you can apply and parents can also monitor the child's progress or points of weakness. It also has a slot for a memory card (up to 50 GB in memory! ), wi-fi and you can download applications (innotab downloadable apps) and ebooks directly from their online store. The tablet received many awards including one by PC Mag. Children tend to love electronics and gadgets and tablets can make great birthday gifts. And they make great gifts also because they are educational!